A brief description of the Valley of Hinnom Tombs follows. St. Andrew’s Scots Presbyterian Church is located southwest of the southwestern corner of the Old City Wall – on the west side of the Hinnom Valley. Just to the east of the Church, and below its parking lot, is a line of tombs that date primarily to the eighth through sixth centuries B.C. 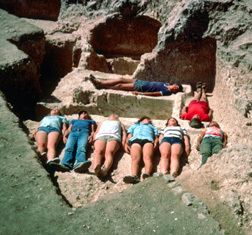 Gabriel Barkay excavated some of these tombs during the summers of 1979 and 1980. The site is called "Ketef Hinnom" ("the shoulder of Hinnom") by the excavator.